Veeram – Trailer of the movie had scenes with lots of punch dialogues and action scenes, which is much more than enough for Ajith fans to watch the movie at least twice on the first day. Ajith is acting in rural based movie after long time.Brother Sentiment Commercial Action movies are very common in Tamil Cinema in 90’S. But, Ajith is doing this kind of role for the first time and hence, it has created good expectation among his fans. This is second movie for director Siruthai Siva. Let us see whether he manages to give a movie which will satisfy Ajith Fans & Common Man in this review. Story: First Half – How love blossoms between Ajith and Tamanna? Second Half – How Ajith safeguards Tamanna’s family? Ajith – Ajith's intro was simple, but will be loved by his fans. Intro Song was better than Arrambam as it was well choreographed. Recent Ajith movies didn't give him much opportunity to perform in various scenes & were one dimensional. In this movie, Ajith gets Mass Scenes, utter best Punch dialogues & most importantly, perform in romance & sentiment oriented scenes after long time. Ajith had to be appreciated for selecting this script which gives more screen for Santhanam & the rest in the first half. Santhanam – The only person who can tease Ajith and can receive applause from Ajith fans. He has more screen presence in the first half, with his best comedy timing dialogues. Vidaarth, Bala, Munish, Sohail have done the role of Ajith’s brothers. Thambi Ramaiah, Nassar, Pradeep Rawat, Abhinaya, Suza Kumar, Vidyulekha etc have done the supporting actors role to perfection. Editor Kasi Viswanathan had to be highly appreciated for the engaging screenplay. Though, the story is pretty old one, the pace of the screenplay was quite good. Music by Devi Sri Prasad – Though, the songs were pretty average, he has made sure that BGM gives more value to screen presence of Ajith in various scenes. There are 2 duet songs in the movie, it would be better if one is removed. Director Siruthai Siva has given yet another Commercial Sentiment Action Movie to Tamil Cinema, but manages to make it a hit by mixing the right ingredients - Comedy, Romance, Sentiment, Action, Mass Scenes and Punch Dialogues. He will be called as ‘Veeram’ Siva from now on. There is lit bit of Telugu flavour in the movie without any doubt. 'Thala 56' and dual roles ?? Will there be a Diwali treat from 'Thala 56'? 'Thala 56' - Big demand in 2 states ! 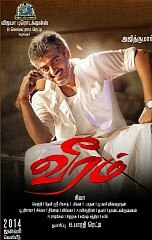 This page has information about Veeram Movie Review by Common Man, Veeram.